Camp Moshava is pleased to announce that Yitzi Matanky will be returning for his second consecutive summer as Rosh Moshava, for second period 2010. Since 1997 Yitzi has not missed a single summer and over the past six years has assumed almost every role camp has to offer, climbing his way up from Rosh Shekem, to Rosh Avodah, and finally to the Rosh Moshava. Get ready for an unforgettable summer 2010, because Yitzi is back and better than ever! Camp Moshava of Wild Rose is excited to announce a wonderful Matching Grant opportunity. We have received a donation from a very generous donor who has pledged matching funds for improvements to our campsite known as “The Hill”, which is used by our Machal and Mach Hach high school campers. The donor will match dollar for dollar for all donations up to $2,500. Donations over $2,500 will be matched 2:1, so, for example, a donation of $5,000 would be matched with a $10,000 donation from the donor, for a total of $15,000 for the camp. All of the funds raised will be used to upgrade and remodel buildings on the high school site, purchase new tents, and enhance the programming. This is a tremendous opportunity for our camp. We hope that you will consider making a donation to this project. There is no minimum amount required to be included in this matching program. The deadline for donations is April 30, 2010. You can donate right now by clicking here. Make sure to check the box for the Machal / Mach-Hach 2:1 Match to ensure your donation will be included in the matching grant. Alternatively, you can mail a check to our office. For donations sent into the office by check, please note on your check that it is for the Hill Improvements Matching Grant.  (Camp Moshava of Wild Rose 3740 W. Dempster, Skokie, IL 60076). We hope that you will consider this tremendous opportunity to make your donation dollars go farther than ever before. Things are Happening at Camp Moshava! Welcome to the brand new online home of Camp Moshava, Wild Rose, WI! Here you are able to see old pictures, take the virtual tour, reconnect with old camp friends, watch Moshava Minutes and even register for camp. It has been a few months since summer 2009 ended and here is what has been happening since then. Thanks to a gracious donation by Maury & Ora Aron and the Sandwich Club restaurant of Skokie, IL, there will be two electrical score boards in the gym this upcoming summer. The score boards will be able to be used for two simultaneous games, making sports in the gym even more fun and exciting. Now if only Moshava could capture the thrill that a person gets from biting into a delicious Reuben wrap from Sandwich Club! As always, safety is a prime concern for this upcoming summer. We are proud to announce that in 2010 Camp Moshava will be a safer place than ever before. In addition to three new defibrillators being donated to camp, each tzevet member will be trained and certified in CPR and first aid before the chanichim arrive. We are also working on getting new Purell dispensers to put around the camp, as well as new drinking fountains. We are also proud to announce a project that is underway in which the entire Machal/Mach Hach camp site (or as we call it around machaneh, “The Hill”) will be revamped. In time for summer 2010 there will be new tents, a new pole building, a new floor for the outdoor beit kenesset and refurbishments for the chadar ochel. We have recently received a donation from a donor who has pledged matching funds to support this project. All donations up to $2,500 will be matched dollar for dollar and larger donations will be matched 2:1. A donation of $5,000 would net the camp $15,000. We hope you will consider supporting this effort. All of these improvements to camp could not have been possible without the help of our wonderful volunteers from the community. Unfortunately though, we are very understaffed and are looking for volunteers to assist with our Alumni and Development Committees. The Alumni Committee is looking for Moshava Wild Rose alumni of all ages to help gather a list of names for people who could be potential donors or help promote Moshava in their respective cities. The Development Committee is looking for volunteers to help coordinate the Moshava dinner, concert or other fundraising activities. Keep your eyes on the Moshava website for updates throughout the year. Summer 2010 is looking like it will be our best summer yet. For events around your community, click here to to check out the events section of our website. 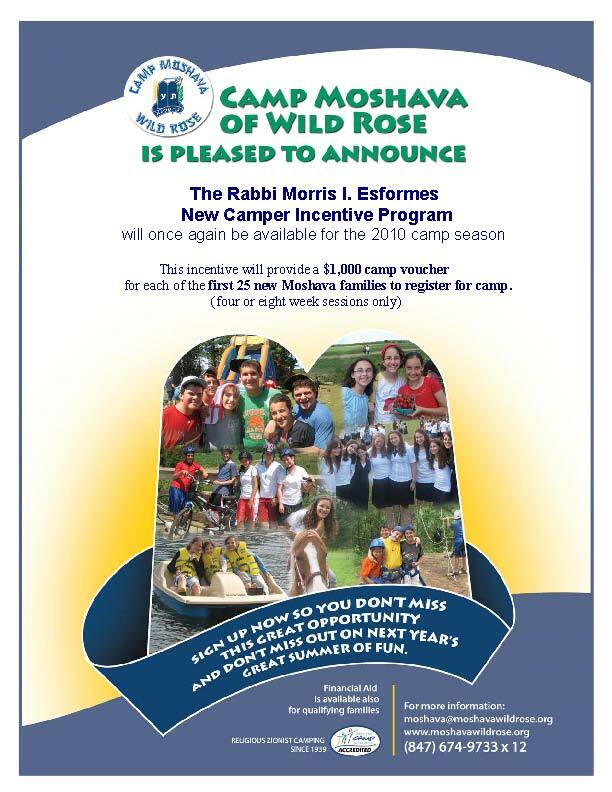 Camp Moshava of Wild Rose is excited to announce that the Rabbi Morris I. Esformes New Camper Incentive Program, created to allow more new families to enjoy a wonderful Moshava summer, will be available again for the 2010 camp season. This incentive will provide a $1,000 camp voucher to the first 25 new Moshava families to register for camp (4 or 8 week sessions only). If you are a new Moshava family or know of any families who are new to Camp Moshava, please let them know about this wonderful opportunity to save money and provide a great summer of friendship and fun for their children. Families can click here to take a virtual tour of the camp and call 847-674-9733 for more information.